This article discusses the role of the Latin language and other classical studies in the thought and work of the Founders, and it argues that sound constitutional interpretation requires an understanding of Latin. In thinking in eighteenth-century English . . . a rudimentary knowledge of Latin is highly useful; after all, every educated Englishman and American knew Latin, English words were generally closer in meaning to their Latin originals than they are today, and sometimes . . . it is apparent that an author is accustomed to formulating his thoughts in Latin. Forrest McDonald was arguably the twentieth century’s greatest constitutional historian. But his case for Latin competency among those seeking to understand the Constitution is, if anything, understated. A popular half-truth is that the framers wrote the Constitution in straightforward language that everyone can understand. If by “everyone” we mean the framers’ immediate audience—the politically-involved public of their own day—the claim is largely true. If by “everyone” we mean today’s public, or even today’s law professors and judges, the statement is entirely untrue. The reason the Constitution’s language was so readily understandable to the founding generation but is obscure to the modern American public is that we lack much of the knowledge they possessed. Involved members of the founding generation knew, or could readily learn about, then-prevailing political practices. They were broadly aware of recent developments in America and Europe, and of the historical background of those events. They were one of the most legally sophisticated generations ever, as Edmund Burke observed in a famous parliamentary speech. Moreover, every boy (and some girls) with educational aspirations studied the Greco-Roman classics from an early age. They were imbued with classical literature, poetry, history, philosophy, fable, and myth. Central to the curriculum was the Latin language, and Latin competency also opened the doors to the scholarship of the Medieval and early-modern worlds. During the founding era, Latin was, in a very real sense, America’s second language. Despite its importance for understanding our nation’s founding and Constitution, none of this knowledge—of eighteenth century practices and law or of Latin and classical studies—is prevalent among the voting public now. It is also rare among the lawyers, law professors, and judges who interpret the Constitution for the rest of us. Later essays in this series will discuss eighteenth century law and political practice as tools of constitutional interpretation. This essay focuses on why the Latin language and, to some extent, its associated classical studies are indispensable tools for understanding the Constitution. I do not argue that everyone should study Latin, but I do contend that one should acquire a reasonable competency in the language before purporting to offer learned commentary on the Constitution. Note that this essay focuses on the value of the language to constitutional interpretation; it does not enter the long-standing debate over the extent of Latin’s pedagogical benefits. Knowledge of Latin is indispensable to a full understanding of the Founders’ literary references and modes of thought. Consider, by way of illustration, Gouverneur Morris, a particularly influential framer and the Constitution’s final draftsman. Morris may have been less dedicated to the classics than Founders such as John Dickinson, Thomas Jefferson, and James Madison, but his early education revolved around the usual classical foci. When attending King’s College (now Columbia University), his two favorite subjects were mathematics and Latin. Morris’ writings reflect his classical training. For example, a favorite phrase of his was Medio tutissimus ibis. It means, approximately, “You will be safest if you go down the middle.” It was the admonition of the sun god Apollo to his natural son, as reported in the Roman poet Ovid’s delightful mock-epic, the Metamorphoses. Morris’ repetition of it communicates something of his belief that moderation is a virtue. By knowing Morris’ commitment to moderation—a commitment held in common with many other Founders—we more readily see that he and his Constitutional Convention colleagues balanced competing values rather than (as some modern commentators have suggested) affording primacy to any single value. Morris’ most famous written production seems also to have been affected by his classical training. When drafting the final Constitution for the convention’s Committee of Style and Arrangement, Morris composed the Preamble in a special way. Rather than adopt the pedestrian prose typical of prior constitutional documents, he selected a tightly organized metric style that, while it was adapted to the English language, carried emotional effects reminiscent of classical oratory and of classical heroic (epic) meter. Morris’ composition, and his colleagues’ decision to accept it, communicated their feelings about the new Constitution’s grandeur and potential durability. Morris was far from the only contemporaneous author to craft prose in that way. Any reader of The Federalist and other ratification-era literature will note the use of classical pseudonyms in pamphlets and articles about the Constitution: the names employed included Publius, Cato, Caesar, Agrippa, Crassus, Brutus, Fabius, and many more—each chosen with the intent to communicate information about the author, and his or her values, to the participating public. 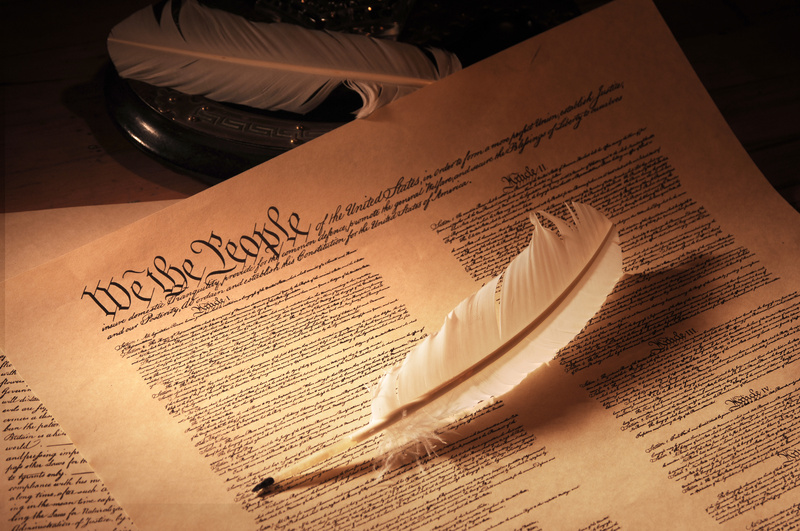 The Constitution is a legal document, designed to operate and be construed in the context of eighteenth century jurisprudence. Latin competency is an absolute requirement for full access to that jurisprudence. This is obviously true of the Roman civil law, which was influential in eighteenth century chancery courts and written almost entirely in Latin. It was also true of native Anglo-American jurisprudence. English law had been recorded originally in a mixture of Latin and Norman French. By the eighteenth century, French had been abandoned, but Latin remained prominent. Latin was prominent not merely in canons of construction and other maxims, most of which have since been translated. Latin headings and excerpts adorned English case reporters, parliamentary journals, and other legal texts. Long and frequent passages of unrendered Latin filled English case reporters, and many of those passages have never been translated. For example, the Case of Mixed [or Mixt] Money, decided in 1604 by the Privy Council, is a “must-read” for anyone who wishes to capture the meaning of Constitution’s Coinage Clause. The case was originally reported in French, with extensive Latin insertions, by John Davies. In 1762, however, an English translation was published, and it accordingly became available to the founding generation. But only the French was rendered into English, so a very large portion of this translation—approximately 1,200 of 8,200 words—remained in Latin. There was no need to translate the Latin for contemporaneous readers, so it wasn’t done. Even today, you cannot read large portions of the Case of Mixed Money—or lengthy passages in many other precedents important to the Founders—unless you can read Latin. For that matter, you face the same problem if you venture into many of their secondary legal texts. The Institutes of Edward Coke, for example, is replete with untranslated Latin. Perhaps the greatest handicap faced by modern constitutional interpreters who don’t know Latin is, as Professor McDonald suggested, the risk—or rather the certainty—of misunderstanding the Constitution’s English. One can easily look up translations of isolated phrases such as habeas corpus or ex post facto. But without knowing Latin, one may never detect unsuspected signals lurking in seemingly ordinary words. This handicap can afflict even the great. Few legal historians have been more celebrated than Leonard W. Levy. Yet even Professor Levy fell into the trap of arguing that the framers intended the Senate to direct foreign policy because founding-era writings referred to the president as a foreign affairs “agent.” Professor Levy apparently was unaware that “agent” then usually carried the Latinate meaning of “one who acts” (from agere, to do or drive), rather than denoting a representative or subordinate. Even writers careful to check etymologies may make mistakes if they are unaware of the linguistic context. The Constitution and the records of its adoption are fairly loaded with English words that may be misconstrued in this way without a background understanding of Latin. Following are four examples from the constitutional text. This word in the Preamble has caused some to wonder how a union could be made “more perfect,” since the modern definition of the word is “without flaw.” Nothing can be more perfect if it is already perfect. The answer is that during the founding era, “perfect” usually meant “complete” (from perficere, to finish). The Preamble thereby announced that new union was to be more complete than that created by the Articles of Confederation. The unamended Constitution employs variants of this word in two other locations, but its meaning in the Privileges and Immunities Clause is the one most thoroughly misunderstood. To a significant extent, the misunderstanding flows from unquestioning acceptance of Justice Bushrod Washington’s unfortunate dictum issued on circuit in the 1823 case of Corfield v. Coryell. That dictum placed within the scope of “Privileges and Immunities” rights the Founders thought derived from God and nature—life, liberty, property, the right to travel, and the like. But that is not how eighteenth century legal documents used the word “privilege” or its mirror image “immunities.” In keeping with its Latin predecessor privilegium, a privilege was literally a “private law.” It was an exception to otherwise prevailing rules that government had carved out for the benefit of citizens generally or for some people and not others. In other words, a privilege was a government-granted entitlement; privileges did not encompass natural rights as Justice Washington mistakenly thought. It is unclear why Justice Washington made the error he did, but his dictum seems to have been off-the-cuff, and no other member of the Supreme Court subscribed to it. Whatever the reason for Justice Washington’s mistake, a researcher familiar with the Latin roots of “privilege” is likely to be sufficiently skeptical to consult the founding-era legal texts that defined the word correctly. The most important appearance of this word in the unamended Constitution is in the Necessary and Proper Clause. Modern readers struggle over it, and are apt to be confused by Thomas Jefferson’s untenable claim that “necessary” means absolutely requisite. Admittedly, it requires more than Latin to know that, in eighteenth century legal documents, “necessary” was a common way of conveying incidence: To describe a power as “necessary” to a principal power was to say it was incidental to the principal, in the way that the power to “lay and collect taxes” implies the power to hire tax collectors. It is easier to understand how “necessary” can have that meaning if you know that in Latin your necessarius (if male) or necessaria (if female) is your relative or close associate. In the Founders’ Latinate English, though, “application” usually did not have the inferior-to-superior connotation. It still carried connotations from the Latin applicatio (which in turn came from the verb applicere, to join, fasten, attach to), which usually denoted the process of connecting one thing to another—much as we now employ the phrase “apply a bandage.” In eighteenth century English, an application could be a communication from an inferior to a superior, but it might just as well run between equals or from a superior to an inferior. So when the Constitution uses the word “application,” it is not referring to a request for a favor. On the contrary, Article V’s use of the future imperative (“Congress . . . shall call”) tells us that a legislative application for an amendments convention is better understood as a conditional command. Among the many misguided public policies that sever us from our cultural roots, perhaps none has been as perniciously effective as the decision of so many schools to deny Latin study to students who want or need it. As a result, even lawyers with the best of professional credentials commonly embark on careers as constitutional commentators without the requisite tools. For one not fortunate enough to study Latin while young, rectifying the deficiency is not easily accomplished. Acquiring Latin competency requires thousands of hours of hard work, rendered harder the older one becomes. For those who wish to be accurate constitutional analysts, I see no remedy over the short term other than laboring at the task for as long as it takes. One long-term solution should be obvious: Institutions of higher learning, including law schools, should insist on at least modest Latin competency among faculty teaching constitutional subjects or offering constitutional commentary. Trying to do a job without the proper tools can be ineffective, and may promulgate or perpetuate mistakes as to what the Constitution really means. Forrest McDonald, Novus Ordo Seclorum xi (1985). See, e.g., Robert G. Natelson, Founding-Era Conventions and the Meaning of the Constitution’s “Convention for Proposing Amendments,” 65 Fla. L. Rev. 615 (2013) (describing the founding-era’s extremely common practice of interstate conventions, knowledge of which was lost to later writers interpreting the Constitution’s amendment process). Permit me, Sir, to add another circumstance in our colonies, which contributes no mean part towards the growth and effect of this untractable spirit. I mean their education. In no country perhaps in the world is the law so general a study. The profession itself is numerous and powerful; and in most provinces it takes the lead. The greater number of the deputies sent to the congress were lawyers. But all who read, and most do read, endeavour to obtain some smattering in that science. I have been told by an eminent bookseller, that in no branch of his business, after tracts of popular devotion, were so many books as those on the law exported to the plantations. The colonists have now fallen into the way of printing them for their own use. I hear that they have sold nearly as many of Blackstone’s Commentaries in America as in England. General Gage marks out this disposition very particularly in a letter on your table. He states, that all the people in his government are lawyers, or smatterers in law . . . .
Edmund Burke, Speech on Conciliation with the Colonies (Mar. 22, 1775), available at http://press-pubs.uchicago.edu/founders/documents/v1ch1s2.html. Girls usually studied modern rather than classical languages, but some learned the classics. Margaret Walker Wythe must have absorbed them, since she later taught her son George both Greek and Latin. Carl J. Richard, The Founders and the Classics: Greece, Rome, and the American Enlightenment 36 (1994). George Wythe later became America’s first law professor, a delegate to the Continental Congress and the Constitutional Convention, a signer of the Declaration of Independence, and chairman of the committee of the whole at the Virginia ratifying convention. George Wythe, Colonial Williamsburg, http://www.history.org/almanack/people/bios/biowythe.cfm. Richard, supra note 4, at 8 (reporting that boys frequently began classical studies at age eight). Id. at 12-38 (discussing school and college curricula). See, e.g., Lynden Evans, The Study of Greek and Latin as a Preparation for the Study of Law, 15 The Sch. Rev. 417 (1907), https://www.jstor.org/stable/pdf/1075247.pdf?refreqid=excelsior%3A7f14150fe4450dccc5d8e68ad394a8f2. Richard, supra note 4, at 24-38 (discussing leading Founders’ immersion in classical studies). 1 Jared Sparks, Life of Gouverneur Morris 5 (1832). See Letter from Gouverneur Morris to James LaCaze (Feb. 21, 1788), in 16 The Documentary History of the Ratification of the Constitution 171 (Merrill Jensen, John P. Kaminski & Gaspare J. Saladino eds., 1976-2017) (quoting the line); The Diary and Letters of Gouverneur Morris 585 (Anne Cary Morris ed., 1888) (quoting Morris using it in his Sept. 10, 1792 entry in his daily reports to Thomas Jefferson while they were diplomats in France); Letter from Gouverneur Morris to Lewis B. Sturges (Nov. 1, 1814), in 7 John C. Hamilton, History of the Republic of the United States of America, as Traced in the Writings of Alexander Hamilton and of his Contemporaries 853 (1865) (also using the line). Publius Ovidius Naso (“Ovid”), Metamorphoses, Lib. ii, line 137. E.g., John Dickinson, who called moderation “a virtue, and the parent of virtues.” John Dickinson, An Address to the Committee of Correspondence in Barbadoes (1766), in 1 The Political Writings of John Dickinson, Esquire 125 (John Dickinson ed., 1801). Robert G. Natelson, The Original Meaning of “Emoluments” in the Constitution, 52 Ga. L. Rev. 1 (2017) (correcting a prominent commentator who argued the Founders granted primacy to the value of “public trust”); see also Robert G. Natelson, The Original Constitution: What It Actually Said and Meant 34-35 (3d ed., 2014) (answering Justice Stephen Breyer’s efforts to grant primacy to the value of “democracy”). For other examples, see Del. Const. (1776) and Ga. Const. (1777). In an effort to be more inspirational, some state constitution writers prefaced their product with a declaration of rights. See, e.g., Va. Const. (1776); Md. Const. (1776). The 1780 Massachusetts constitution, written primarily by John Adams, featured a rather ponderous preamble. But no prior constitution writer accomplished quite what Gouverneur Morris did. Robert G. Natelson, The Constitution’s “Poetic” Preamble, The American Spectator, Feb. 13, 2018, https://spectator.org/the-constitutions-poetic-preamble/. A similar sense is communicated by the inscriptions the Founders chose for the Great Seal—Novus ordo seclorum (“new order of the ages”) adopted from Virgil, Eclogue iv, line 5 (“magnus ab integro saeclorum nascitur ordo”) and Annuit coeptis (“He [God] has approved our undertakings”), adapted from Virgil, Aenead, Bk. ix, line 625 (“Iuppiter omnipotens, audacibus adnue coeptis”). E.g., Edward Gibbon, The Decline and Fall of the Roman Empire (1776) (second sentence) (“The frontiers of that extensive monarchy were guarded by ancient renown and disciplined valour.”). The portion of sentence from “guarded” to “valor” is scanned in dactylic hexameter, the standard for Greek and Latin epic. Gibbon repeated the device throughout his work. Gibbon’s scansion is closer to actual poetry than Morris’, but the emotional effects of the two are similar. The most complete collection of ratification-era writings is The Documentary History of the Ratification of the Constitution, supra note 10. See also Richard, supra note 4, at 39-43 (discussing the Founders’ use of pseudonyms as symbols). The Corpus Juris Civilis, compiled under the direction of the Eastern Roman Emperor Justinian (reigned 527-65 C.E. ), was the standard source for the civil law. Several years ago, my daughter Rebecca Natelson Chertudi and I edited Justinian’s works for Internet use. See https://i2i.org/constitution/roman-law-sources/. A comparatively minor part of the collection was composed in Greek, but we posted Greek passages in Latin, following Theodor Mommsen’s translation. E.g., S.S. Peloubet, A Collection of Legal Maxims in Law and Equity (1884) (containing an extensive list of Latin maxims with accompanying English translations). The same practice was followed in America for a time. E.g., 1 J. N.Y. Provincial Convention 3 (beginning entry for April 21, 1775, with the phrase, “Die Veneris, 10 hora, a.m.”—that is, Friday, at the hour of 10 a.m.”). P.C. 1604, Dav. 48, 80 Eng. Rep. 507. U.S. Const. art. I, § 8, cl. 5. See Robert G. Natelson, Paper Money and the Original Understanding of the Coinage Clause, 31 Harvard. J. L. & Pub. Pol’y. 1017, 1030-34 (2008) (discussing the Case of Mixed Money and its implications). Anonymous, A Report of Cases and Matters in Law, Resolved and Adjudged in the King’s Courts in Ireland, Collected and Digested by Sir John Davies 48 (1762). E.g., 1 Coke Institutes 233a (quoting royal grants of hunting and forest rights) & 238b-239a (quoting a Latin statute). Leonard W. Levy, Original Intent and the Framers’ Constitution 38 (1988). Other legal writers have made the same mistake. Howard R. Sklamberg, The Meaning of “Advice and Consent:” The Senate’s Constitutional Role in Treatymaking, 18 Mich. J. Int’l L. 445, 455 (1997) (stating that Alexander Hamilton’s use of the word “agent” in referring to the treaty power “suggests a limited presidential role”); Arthur Bestor, Respective Roles of Senate and President in the Making and Abrogation of Treaties: The Original Intent of the Framers of the Constitution Historically Examined, 55 Wash. L. Rev. 1, 109 (1979) (reaching the same conclusion based on Madison’s use of the word “agent”). Cf. 2 Records of the Federal Convention 539 (Max Farrand, ed. 1937) (Sept. 7, 1787) (reporting James Wilson objecting to Senate’s own “agency” in the process of appointing ambassadors); Richard, supra note 4, at 15-16 (quoting a schoolmaster referring to himself as the “agent” and a boy as the “object” of a whipping, supposedly to teach the boy the nature of a transitive verb). See Natelson, Emoluments, supra note 13, at 7-8, n. 11 (discussing mistakes by an author who attempted to account for Latin etymology, but apparently did not have the background for doing so). Perhaps in the spirit of the founding-era maxim Abundans cautela non nocet, one additional example—this one from outside the Constitution’s text—wouldn’t hurt: From founding-era descriptions of Indian tribes as “nations,” some scholars have concluded that European-Americans recognized tribes as sovereigns, and therefore did not apply state law to them. In fact, this particular use of “nation” was a Latinate usage deriving from natio—meaning an ethnic group. Robert G. Natelson, The Original Understanding of the Indian Commerce Clause, 85 Denv. L. Rev. 201, 259 (2007). Incidentally, Abundans cautela non nocet means “Overflowing caution doesn’t hurt.” It is a canon of construction explaining that the rule against surplus is not invariably applied. U.S. Const. art. I, § 6, cl. 1 (providing a limited privilege from arrest for members of Congress); id. art. I, § 9, cl. 2 (referring to the writ of habeas corpus as a “Privilege”). Id. art. IV, § 2, cl. 1 (“The Citizens of each State shall be entitled to all Privileges and Immunities of Citizens in the several States.”). 6 F. Cas. 546, 551-52 (C.C.E.D. Pa. 1823). I dissect this dictum in Robert G. Natelson, The Original Meaning of the Privileges and Immunities Clause, 43 Ga. L. Rev. 1117, 1123-24 (2009). See generally Natelson, Privileges and Immunities, supra note 33. One of those sources was the 1762 edition of Giles Jacob’s New Law-Dictionary. Id. at 1130. See Jefferson’s Opinion on the Constitutionality of a National Bank: 1791, http://avalon.law.yale.edu/18th_century/bank-tj.asp (“to those means without which the grant of power would be nugatory”). On the background and meaning of the Necessary and Proper Clause, see Gary Lawson, Geoffrey Miller, Robert G. Natelson & Guy Seidman, The Origins of the Necessary and Proper Clause (Cambridge Univ. Press 2010). U.S. Const. art. IV, § 4 (“The United States . . . shall protect each of them against Invasion; and on Application of the Legislature, or of the Executive . . . against domestic Violence.”). U.S. Const. art. V (“The Congress . . . on the Application of the Legislatures of two thirds of the several States, shall call a Convention for proposing Amendments . . . .”). On the use of “application” in the convention context, see Robert G. Natelson, Counting to Two Thirds: How Close Are We to A Convention for Proposing Amendments to the Constitution? 19 Fed. Soc. Rev. 50 (2018), https://fedsoc.org/commentary/publications/counting-to-two-thirds-how-close-are-we-to-a-convention-for-proposing-amendments-to-the-constitution. This comes from personal testimony: I began Latin studies at age 32 while actively engaged in the practice of law. The task was not an easy one, and nearly 38 years later I still struggle with many texts. Fortunately, today’s classical and classical-Christian elementary schools have re-learned what educators of the founding generation already knew: Languages are best absorbed by the young.